Sure Ernst, I'm happy to cooperate here (assume James agrees). I'll do some more analysis on Alp Ori removal (maybe include H9) and linear projection for the T2 times. However, T1 will be problemmatic, these features are very changy, perhaps the H8 having some baseline to attempt a date projection. Fortunately, T2 seems to be quite definite, thanks to James . In case an eShel owner could upload somewhere a good quality Alp Ori, I'd also attempt processing H-beta and H-gamma, too. Subtracting M comp. gives the ability to use a stable continuum level and to select the accurate region that needs to be measured - especially when feature is weak. To show some progress, this is where I am currently (I've processed H-beta from ARAS database for my curiosity, and afterwards H11 from 2017.07.15 - 2017.11.20). Since not having Alp Ori to subtract, the average continuum was used - hence going EW positive (but then settles). My est. for T2 of H-beta/V and H-beta/R would be 2017.11.16 (the last spectrum is 11.23 by JGF). You can see that H-beta's R component is starting to fade only in the last "minute", whilst V starts very roughly at approx. JD=970. By the way, their ratio is smooth - could attach more graph to demonstrate, but my aim with H-beta is only to put my UV material into a wider context. Also noticed that H-beta is much closer in behaviour to the Balmer end. Now gone into the H11 serie (started a bit late), quality is very good till the chromospheric eclipse event (between 2017.09.08: JD=8005 - mid of Sept, as published already). Important: before chr. eclipse, subtracted Alp Ori in a ratio of 1:4 (it's a well calculated value on fine detail drops). After the chromospheric event, subtracted 1:1 Alp Ori, added +1 again (so normally just made relative to a 1:1 Alp Ori again). These subtractions helped me to find a more or less straight continuum. All in all, theoretical continuum ratio should be 3:1 by estimated intensities before/after chr. eclipse. But, the EW(CuII 3806) after eclipse seems to have realistic jump, following the inverse Umag curve. My analysis result is, the T2(H11) must be towards James's first spectrum (11.03 - 11.14), the high variations (good quality before eclipse) prevent me doing better estimate, requires visual confirm (see 1 page back). Next I'd address H10 and H8, be aware I have enough free time only at weekends. 1 hrs of exposing available. if we take a look at the descent of the Halpha emission, we recognize that T2 (of Halpha) has still not reached. Since Hbeta and H11 are coming from the inner part of the disk, we should expect that its T2 should be reached clearly after Halpha-T2. If we take the egress observations (1977-79) of Möllenhoff & Schaifers (A&A 94) we can noticed that Hbeta did appear after Halpha, with a time difference of approx. 93 days. So that means that T2 of Hbeta and H11 can to be observe only after T2 of Halpha. Based on H11-H8 inverse P-Cyg - rather symmetric on UV end - profiles, I am guessing that H11/R and H11/V are coupled. Also thinking that H11 must be is very close to H-beta, as their V component is fading similarily (only like a 10 days difference by T2). (Did look at H-gamma T2, and essentially the same as H-beta by day). And, observed that the H11/R absorption gets more and more prominent on Balmer lines from H-gamma. Also let's notice, that H-beta/R (and even H11/R) are approaching zero EW at the same time. H-alpha seems in the Balmer serie of VV Cep the exception. My gut feeling from the above, that H-beta + above lines are corresponding to a hotspot where the material is falling in (and the above couplings tell me H11-Hbeta coming from the same small place). If it's such a whirlwind hotspot, I can easily imagine that it migrates - besides the numerius possibilities that H-alpha has changed. Otherwise, a simply (and enough) excited material used to produce all the Balmer lines (with the usual decrement). - the reason why I see the +10 days between H11 and B-beta, easy to explain by opacity - they might even be perfectly at the same place! Finally, I've managed to compile a summary for the UV Balmer end. Having received an eShel alpha Ori from Francois T., after the subtraction H-beta still show a weak symmetric double peak (both -0.5 EW), so by theory not zeroed fully. Also processed EW of H-gamma meaningfully now, interestingly role of V and R peak switched... here only showing the total EW, but both went to minima (with a bit more noise). H-gamma does not seem to have yet any clear absorption (after subtracted alpha Ori). These subtractions in the visual worked without problem (normalised to a nearby continuum - separately for both H-beta and H-gamma, not having to bother with deredden). It is interesting that the V-jumps correlating for all (meaningful till the athm. eclipse: JD=1009), since by theory I was removing alpha Ori for both H8V and H11V (in a 1:4 continuum-ratio; after eclipse 1:1). The growing Fe I line in the middle of H8V shape was manually fixed (IRAF: splot/j, splot/i), that "drawing" is not show here. The last 3 spectra requires visual confirm. Hereby I've compiled an alpha Ori subtracted global plot for H8, using an order 2 legendre continnum fit on the regions [3868:3870,3984:3986,3995:4005]. I highly recommend downloading both H8 and CaII mosaics and blink on each other - it is telling the same happening on CaII as H8 ! The first box is from 2015, and the last 3 are from James R. Foster (JFO). To demonstrate variability, you may compare 2458005 and 2458006 (just before athm. eclipse). The very last (2017.11.22) shows a peak right to H8 center seems to be real, but I'm unsure whether it's really H8, and alpha Ori subtraction less working (absorptions are somewhat deeper than the reference alpha Ori). H11/H10 basically showing that H8, but have the longest serie only for the H8-CaII region. - I'd estimate T2(H8, H11) to approx. Nov.01, by +/- 5 days accuracy (by human look and visual confirm of the last 3 spectra). - H8(/H11) show infall profile, changes show symmetry - can we say a whirling hotspot, where the material is falling in? Update: my EW diagrams above (Balmer) so far all relative to a local continuum; nothing in the absolute sense. Importance has emerged trying to absolutize these EWs anyhow, so these days I attempt to making my spectra relative to the earler frequently taken '7 Cep' ref.star. So I've started reprocessing all my spectra with the 2-star photometric method, leaving '7 cep' defined in ADU (that falls out via division anyway), and express everything in relative to the ref.star's intensity. Important: for spectrum of 08.07, I've been using the missing ref. star '7 cep' average from the next night on 08.15 (in fact, the '7 cep' curve 07.25, 08.15 and 08.18 are very similar by absolute ADU). This is a doubt remover that the flux decrement was coming from '7 cep'. Next I'm going to rework the CaII region. Of course, using '7 cep' has never got widely agreed (I have special reasons: 2-3 minute exposure; very close; not known as variable), but such a discussion should go into the ref.star topic. Any confirmation of this roughly (+/- 2) 23 days (JD: 2457950.4028, 2457973.4367, 2457996.3829) flux decrement would be welcome. 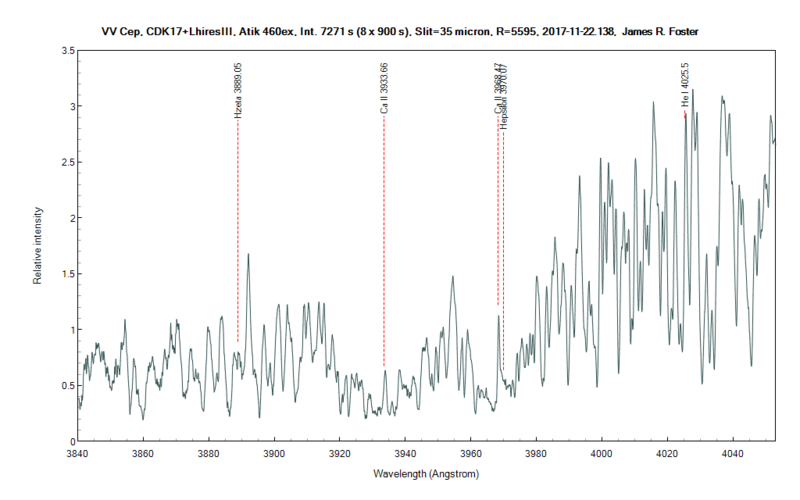 I've finished reprocessing my spectra absolutizing them relative to '7 cep', disabling normalisation in ISIS. Besides relativisation to '7 cep', I am now able to provide an absolute flux estimation, using a simple constant multiplier relying on David Boyd's spectrum from the ARAS Database "asdb_vvcep_20160911_860_flux.fit" being closest to my "asdb_vvcep_20160911_007.fits", by a common flux in the 3904-4004A region. It would be nice to have a few more checkpoints, but I don't have any in 2017 at this moment, and the final aim is only an attempt presenting my results in absolute flux roughly (all relative to 7 cep indeed), rather than providing precise flux measurements. In general, shot 2 regions: 3706-3865A, and 3865-4010A. Picking now 2 regions to represent the fluxes of continuum for them: [3754.313, 3756.745] for the lower, and [3867.818,3870.765]. In these graphs in general, the lower continuum flux from [3867-70] is multiplied by 1.5x to get to the same level visually. Additionally, I've found a method to determine M ratio based on absorptional match, using a trivial 2-dimensional search for (shift, multiplier) in sane limits, searching for the minimum of the error. Error function: median(abs(difference spectrum)). Please be aware that the usual stddev (or least square method) won't work well, really need median (or any kind of clipping) to ignore errors. Of course, rectified all spectra before by an order=3 polynom, subtracting to 0-level (hence the algorithm was unaware of any total flux). In the lower UV region, restricted wavelength range for that search, while at CaII I've given the whole. By chance, estimation on the lower UV region (black dots) is almost matching with the higher CaII's W-shape fitting. In other words: B and M component faded at the same time, the same ratio was kept! That diagram contains also my CuII 3806 and NiII 3993 flux measurements, the latter one seems NOT to follow the flux drop. This is interesting, as I was expecting to follow it. After subtracting M components (using ratio estimation from the algorithm above), continuum got straight enough to measure Balmer features in both UV regions (H8, H11), even after eclipse (where 1:1 subtraction would give senseless continuum, till deep eclipse as my last 2 observation where 100% is really the M). As you see, Balmer was clearly reacting on the B and M flux changes linearily, hence I think in this special case, my earlier report of continuum relative EWs is making more sense before the eclipse. Using stable features in the CaII region (CaII 3933, CaII 3968, Ni II 3993) and their common flux mean allows estimating flux of James Foster (JFO), so that I can fill important gap in 2017.Nov-Dec.
That gives an absolute flux estimate to JFO spectra (+/- 10% fault possible, since the 3 features jump independently like 25%). Note that the CaII features best to elaborate only after the eclipse (high order polynom was needed before eclipse), and CaII 3868 had to be "deblended" from 2 features (splot / d, g, g, q, a, a, y/n, c, q commands). But if you wouldn't be a believer so far, just look at the BAV page where Umags serie show similar curve. So here we caught the TiII 3900, 3913A lines in emission (JFO confirming it), and I've also had such a state on 2458025 (2017.09.28), that was the minimum state right after eclipse start (the 2nd spectrum). About M removal estimation: those spectra would go negative (some minimums at CaII already gone slightly below 0) together with continuum if I'd subtract more than the estimated. But, this is the result of the min. search algorithm, that is unaware of the absolute continuum level. 1:1 subtraction works only at the few caught minimas (exactly where the TiII 3900, 3913A lines seen clearly in emission, and continuum looks cleanly zeroed via the 1:1 M-removal). In the very end (at absolute 0 level), you can see the M-removed last CaII region!